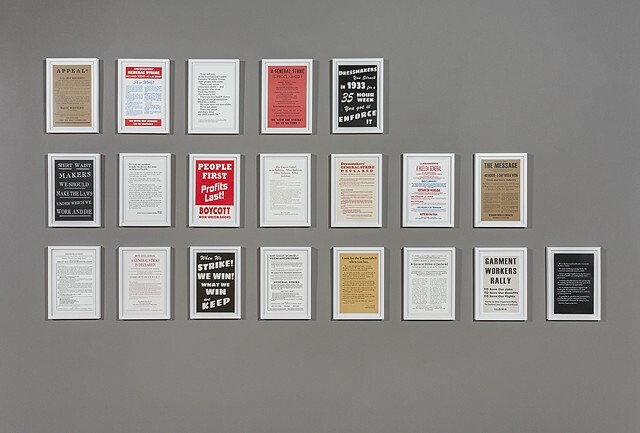 The 20 prints are based on broadsheets, flyers, posters, and advertising created by the International Ladies Garment Workers Union (ILGWU) from approximately 1890 to 1982. Prints were digitally recreated in Photoshop and Illustrator based on original, historical print materials produced by the ILGWU. They attempt to reproduce the original language, typography, and design of their corresponding original materials as closely as possible given the passing of time, and corresponding shifts in design and print technologies. Material research was conducted at the ILGWU labor archives at Cornell University, in June 2015.